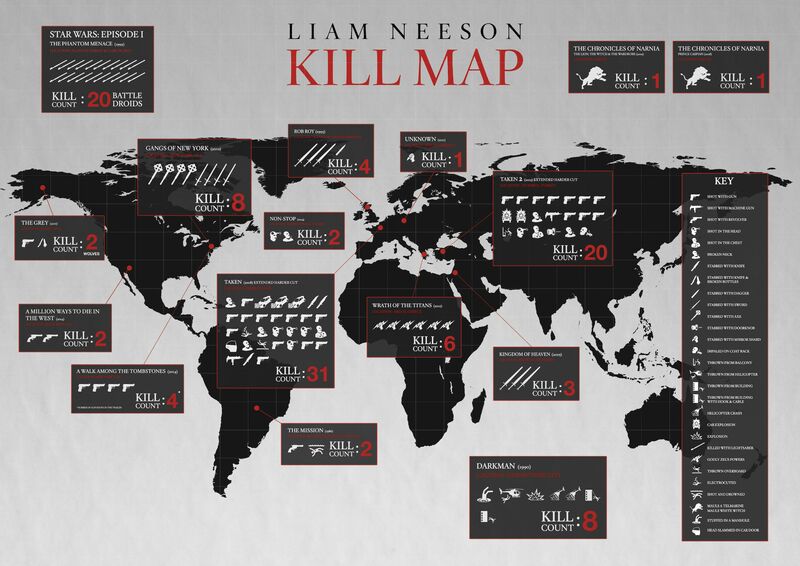 In one of the better pieces of promotional tie-in artwork, in this case to promote this week’s release of the crime-thriller “A Walk Among the Tombstones,” Universal has posted up what they dub a ‘Liam Neeson Kill Map’. The map shows the body count racked up by Neeson’s various characters over the course of his career – from the wolves of “The Grey” and the English of “Rob Roy,” to the witches and droids of the “Narnia” films and “Star Wars: The Phantom Menace”. Previous articleGhostbusters Get A Cinematic Universe? Next articleSerena Delayed As No-One Wanted It?